With one master key, you can gain access to commercial and residential property. The Knox System includes UL listed lock boxes, storage cabinets, heavy-duty padlocks and electronic override key switches. Property owners in the community store entrance keys, access cards and floor plans in high-security Knox-Box® key boxes mounted near the building entrances. 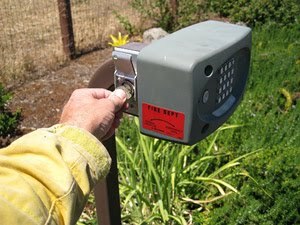 Each Knox-Box purchased by the property owner is keyed to a single master key. With the Knox System, there is no ongoing cost to the Fire Department, no waiting for a property owner to unlock the door in the middle of the night, and no forcing the door open to gain entry. The Knox Rapid Entry System reduces response time, property damage and the liability for lost keys. You can now only place your Knox System order online. For more information, please contact the Escondido Fire Department at 760-839-5400.